Dogs lead a very active life, and a part of that active life includes travel in a car, sometimes on a a daily basis. 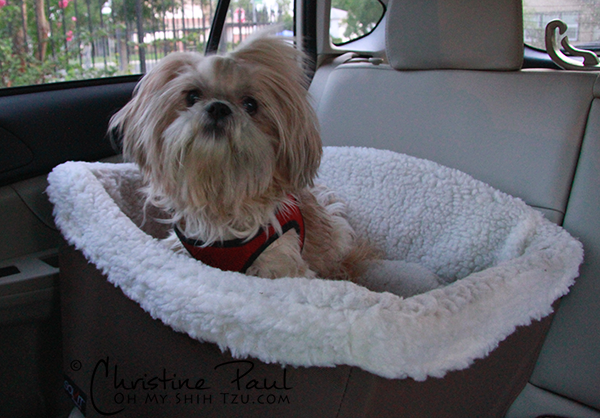 As guardians, Shih Tzu car travel is very important in keeping these beautiful creatures safe, which means taking special precautions to keep them safe during travel. But while I was roaming the web I found an interesting study. The study was on pet harnesses we use to secure our beloved pet dogs while in the car. And of the 12 harnesses in the study ZERO failed to perform properly!!! A 100% failure. The study was conducted by the Center for Pet Safety, a non-profit 501(c) research organization dedicated to companion animal and consumer safety. The study which was performed in July 2012 by a third-party independent test laboratory, MGA research organizations. Since there are no mandates or federal regulation on pet restraints, the studies were based on set conditions of the Federal Motor Vehicle Safety Standard 213 for child safety restraints. 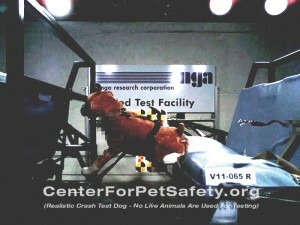 Of the 12 harnesses researched, 4 were used as a control group that were of well known trusted pet companies. The study was based on the AKC’s Most Popular Dog Breed List from 2010. 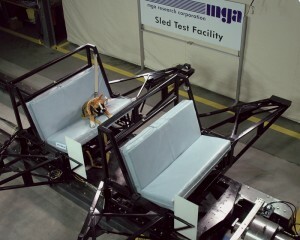 The study used those dog breeds that fell into the “large” harness category and a realistic crash test dog was designed and weighted at 55 pounds for data collection. As a result of all this, in March of this year Subaru of America, Inc. has teamed up with the Center for Pet Safety to develop and create standards for testing restraints, while announcing those that perform best. Without this, manufacturers can claim to test their products without the claims actually being substantiated. I am sure glad we bought a Subaru in May!! Unfortunately I have not been able to find which harness were used in this study. But it doesn’t stop me from trying to protect my dogs the best that I can. I use two different forms of saftey when I travel with my littles. One being a harness and the other a booster seat. 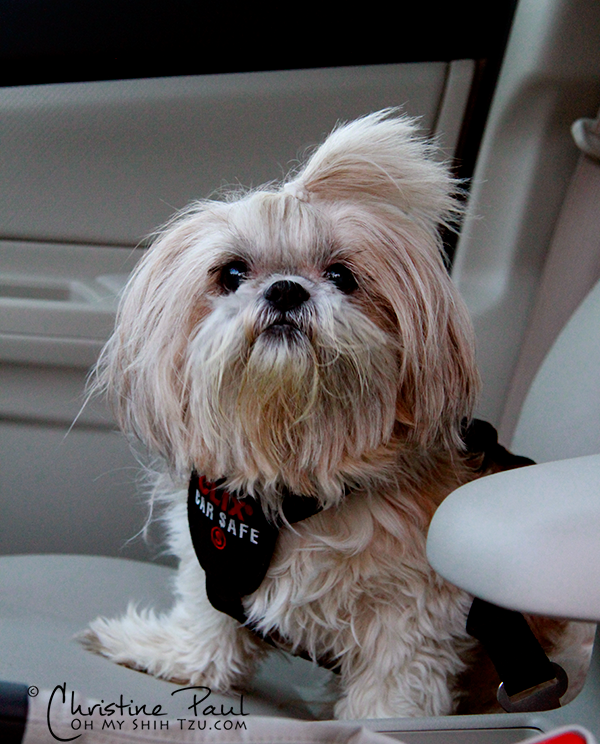 The harness that I use is the Clix Car Safety Harness, size small for a 14 pound Shih Tzu and a medium for my 18 pound Shih Tzu. Though this picture is taken with Katie in the front seat, they always travel in the backseat. I chose to purchase this harness because of the chest pad, along with the ability to snap into the seat belt lock. I have never had to stop abruptly when using this harness, so I do not know how it would actually perform. I tend to use the booster seat a lot more for everyday use. I use the Solvit Tagalong Jumbo On-Seat Booster because it is able to be strapped down with the seat belt securely. 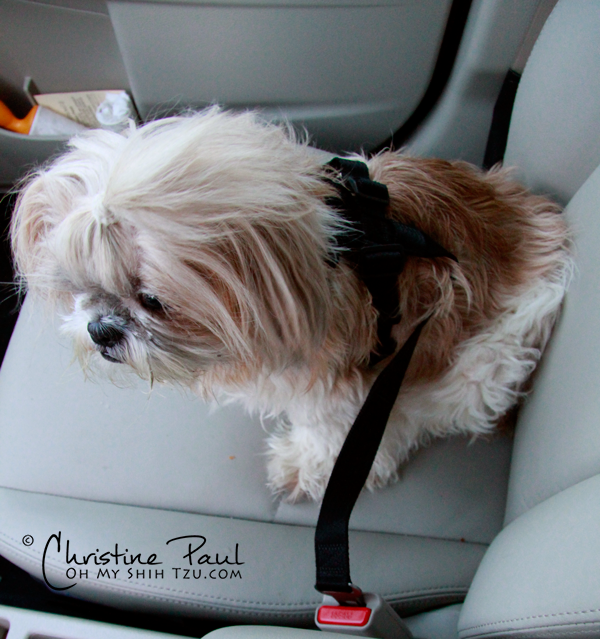 I then use my dogs standard step-in harness to attach it to the safety strap within the booster seat. The seat is always placed in the back seat behind one of the front seats. There are other options you can use for transportation of your pet. Many people use hard sided kennels, such as a Vari-Kennel, or wire crates. 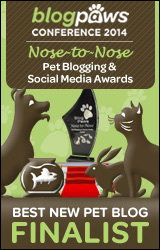 When it comes down to it, it is just personal preference on how we like to attempt to keep our pets safe. The whole point is that we take the extra step to keep them safe while traveling. Please don’t ever put the “booster seat” next to the rear door of a car with side impact or curtain type air bags. They’re directly in the path of the air bag! Place them in the center of the rear seat, or don’t use a booster if they want to be on the side. Make sure your tether is SHORT! If the tether is long, the dog will fly around the inside of the car as the tether and harness extend and then stretch. look at the videos above, and shorten those tethers! Harnesses don’t perform well on a dog my size. I have a specially built cage in the car. Great post, it’s very important to secure us dogs in the car! Not only for during an accident, but also afterwards. Recently there was a dog not too far from me that got scared after being in a car accident and ran away. It took at least a week, with the community searching, for him to be found. Pippy recently posted…Happy 4th of July, America! Thank you so much… yes it is very important. I heard of a story a while back about a lab not being secured in an SUV, they were not in an accident but the sudden stop projected the dog through the SUV. The outcome was not good, the couple lost their dog and their toddler. Wow I just read your article after Cinnamon reminded me to look for your posting on safety It was very informative and will make me search the internet for a appropriate harness for Cinnamon’s size. Thank you!